Yesterday, the Mayor of Derry Strabane Council, Cllr John Boyle, and Stuart Moore from the Siege Museum, were at Boom Hall, lending a hand to the QUB Centre for Archaeological Fieldwork team of archaeologists, led by Ruth Logue. The Siege Museum are delivering an outreach programme this Autumn, to deepen the understanding of the 1689 Siege and its legacy. Please click the link below for a copy of this years Maiden City Festival programme. The Siege Museum has produced a new Armistice Centenary Jewel. A total of 300 has been struck. Siege Museum Management Committee in conjunction with Mountjoy Womans LOL 29 invite you to a quiz afternoon in the Apprentice Boys Society Social Club, Londonderry, on Saturday 3rd March commencing at 4.00pm. The diary at the Siege Museum is filling up quickly. We strongly advise booking your club, group, lodge or community visit as soon as possible. The Siege Museum management committee pictured with Nora Milligan, the daughter of the late C.D. Milligan, at the launch of the reprint of his book 'The Siege of Londonderry 1689', at the Siege Museum. Comedian John Bishop recently spent time with Siege Museum staff, learning about the history of the Siege of Derry and Apprentice Boys Association. The launch of the reprint of C.D. 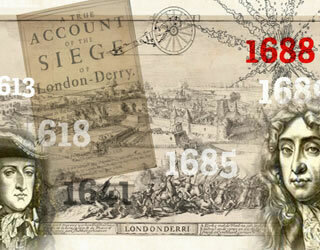 Milligans Siege of Derry, scheduled for Wednesday 6th September has been postponed. We will announce a new date when we receive confirmation.